South Lampung, Indonesia – Maskah, who like many Indonesians goes by one name, woke up on Saturday night to the sound of wooden fishing boats splintering apart outside her house in the village of Sukaraja in South Lampung. Other villagers followed Maskah, many carrying young children. They trekked over a kilometre and a half along a muddy track on Rajabasa Mountain to a partial clearing called Kebun Damos. 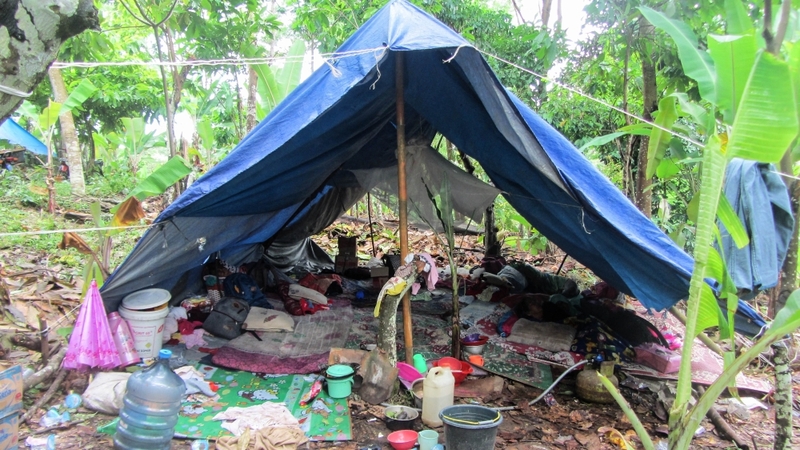 The families spent the night huddled together under trees and sleeping on banana leaves.”It was raining hard and we were all soaked,” said Maskah. A powerful tsunami hit Banten and Lampung provinces on Saturday night, leaving at least 430 people dead. The eruption of Anak Krakatoa volcano in the Sunda Strait is widely thought to be the cause behind it. Some 16,000 people are now displaced, including many of the residents from Sukaraja village, who lived close to the shoreline. Most of them are afraid to go home, worried another tsunami will hit their village again. The morning after the tsunami, Maskah, 39, and other families went back to their houses to collect clothes and other personal items before returning to the safety of the mountainside. They are fearful that Anak Krakatoa will erupt again and are too traumatised to go home. “That sound in the distance isn’t thunder,” said Ruminah, 32, another resident of Sukaraja village. Food is scarce in the makeshift camp and as of Wednesday, the residents were yet to receive adequate assistance from the government. Up to five families sleep in tents which the villagers built themselves using tarpaulins and mosquito nets. The families say they need proper tents from the government, as well as blankets and cooking equipment. At the moment, they make fires from wood found in the jungle to prepare their food. While other local residents and charities have donated crackers, instant noodles and water, the supplies are not enough to feed the group of over 100 people at the camp. 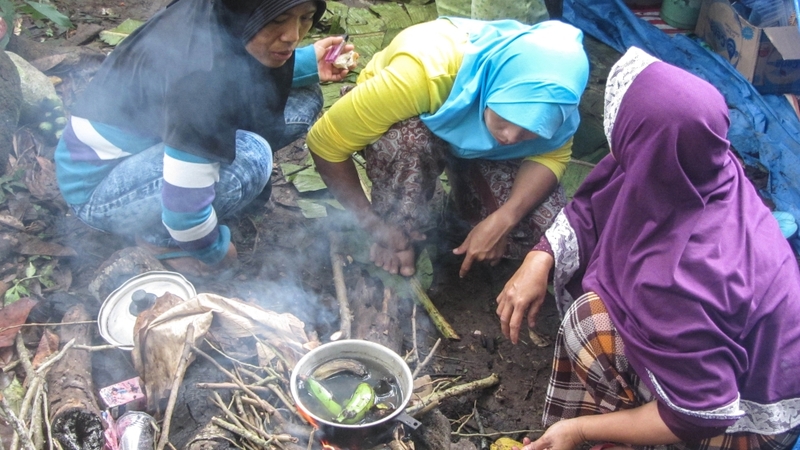 In the meantime, the displaced families have tried to supplement their diets with food scavenged from the surrounding jungle, including unripened bananas which they boil to make edible. Like other villagers, Maskah and Ruminah are critical of the government’s response to the disaster. They say it is “disappointing” as aid is yet to reach them. On Wednesday, Jarco, a representative of Badan Amil Zakat Nasional (BAZNAS), a non-structural government organisation that reports to the president, arrived at Kebun Damos to carry out an assessment of the needs of the displaced residents. He told Al Jazeera that the sluggish government response was due to the logistics of getting aid to such remote areas. “Access is difficult. We have offered the residents the chance to shelter in a local junior school building but they don’t want to,” he said, adding that he hoped tents would arrive at the camp by Wednesday afternoon. Meanwhile, other residents have attempted to fill in this gap. 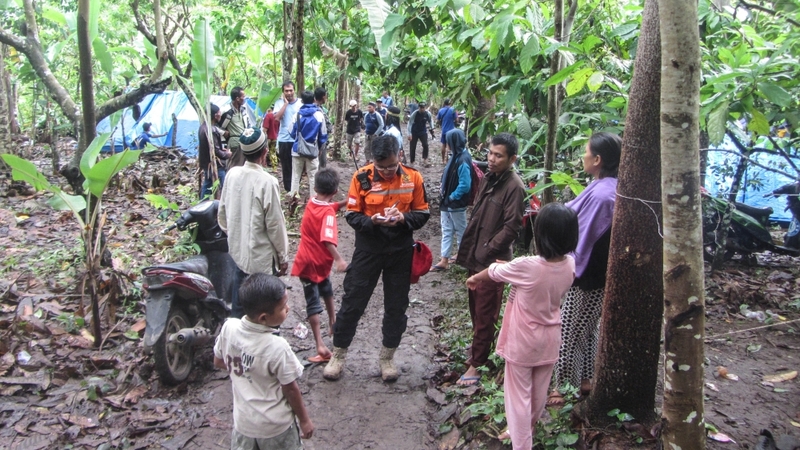 Hari Purnomo, a villager from neighbouring Rajabasa village, is coordinating the local response to the displaced villagers while they wait for government aid to arrive. In addition to the camp at Kebun Damos, there are several other camps of displaced people from other villages dotted around Rajabasa Mountain. Purnomo has been collecting donations to take to the camps. He says the local government has only focused on distributing aid along the coastal areas, while areas that are further inland, have been left out. According to Purnomo, it has been difficult to deliver aid to a group of over 1,000 people from coastal areas in South Lampung, who have taken refuge further inland along the mountainside. “I’ve tried to talk to them and ask them to come a little further down the mountain,” he told Al Jazeera. Local authorities, delivering medical aid, are also trying to overcome similar obstacles. Minak Wardan, secretary of the central health clinic in Rajabasa district, which includes Sukaraja village, says that the health authority has set up a series of mobile clinics which have driven into mountainous areas to distribute medicine. Despite making three trips since the tsunami hit, the clinics have not been able to reach all the camps due to the difficulties in gaining access. Maskah and Ruminah have no plans of returning to their homes in Sukaraja village. They say they will remain in the jungle until the threat of Anak Krakatoa erupting and triggering another deadly tsunami is no longer there. Indonesia‘s Meteorology, Geophysics and Climatology Agency head Dwikorita Karnawati has asked people to avoid coastal areas as stormy weather and high surf continue to plague the area. “All these conditions could potentially cause landslides at the cliffs of the crater into the sea, and we fear that that could trigger a tsunami,” she said. Eleven residents from Sukaraja village are missing and presumed to be dead. The displaced residents feel that the likelihood of another eruption and tsunami is high.